15 years ago, subscription boxes didn’t really exist. There were part instalment magazines and magazine subscriptions that came with free gifts or kits each month. You could get everything from model airplanes to perfume. So, unless you were willing to pay your local newsagents a delivery fee, you’d walk down to their shop every week, or every month, and dread forgetting to pick up the latest copy. This was also before we had smartphones, lightning speed internet access, and before we ever thought of subscription boxes. Do you remember life before Amazon? This was all before internet shopping became the norm though, and far before we even dreamed of services like Amazon Prime. We used to be willing to wait for things, and build them over time. Some of us still are, but now, we’re more used to getting what we want, NOW. As children, our parents did their level best to teach us to be patient, but now we live in a culture that insists on instant gratification. If the internet is ‘too slow’ we’re angry, god forbid we don’t have internet for a day. Just take a look at this graph on video abandonment rates. We now have the capability to think of something we want, find a supplier and have it on its way to our homes in less than an hour. Our smartphones have made life much easier, but there’s a tangible link between them and our inabilities to wait. The largest retailers have reaped the benefits of this culture shift, but for smaller creators and providers this mentality of “I want it now” brought hurdles with it. Many providers and creators have learned to adapt, but sadly, many villages have lost their local newsagents. Our newspapers are sent straight to our devices, so are our magazines. And sadly, often, there wasn’t enough custom to keep those beloved businesses afloat. As our news services moved to digital distribution, and so did our shopping habits, all of this occurred on our tech devices instead. Flip phones transformed to touch screens, and our sometimes slow computers became the immediately responsive interfaces we rely on today. Our orders became quicker, impatience grew, and then to stave off boredom and impatience we became reliant on always having something new. Take a look at the numbers of films released in a year, for example. In 1957 just 23 films were released in the entire year. Compare that to 2017 when 173 films came out in January alone! We have low attention spans, and then, we added worldwide shipping to our shopping capabilities. Ahh, worldwide shipping, connecting us to products we never imagined for prices well below their UK equivalents. It has helped families with ties to other countries stay connected to the recipe ingredients they love. It has also introduced pretty much everyone to at least one product they never knew they needed* before. Our obsession with new, and now, coupled with the subscription service model, finally led us to subscription boxes. Subscription boxes meet all of our needs, or rather, ‘tick all the boxes’ as it were. *Ask yourself, do you really need it? The very first subscription boxes were things like ‘The Sampler’ in 2004 — which is still going strong by the way. The Sampler offers the chance to experience smaller, and larger, print magazines on a monthly basis. The variety removes the feeling of commitment and risk of boredom that comes along with longer, single publication subscriptions. Continual ‘newness’ helps reduce the chance of cancellations due to stagnation. 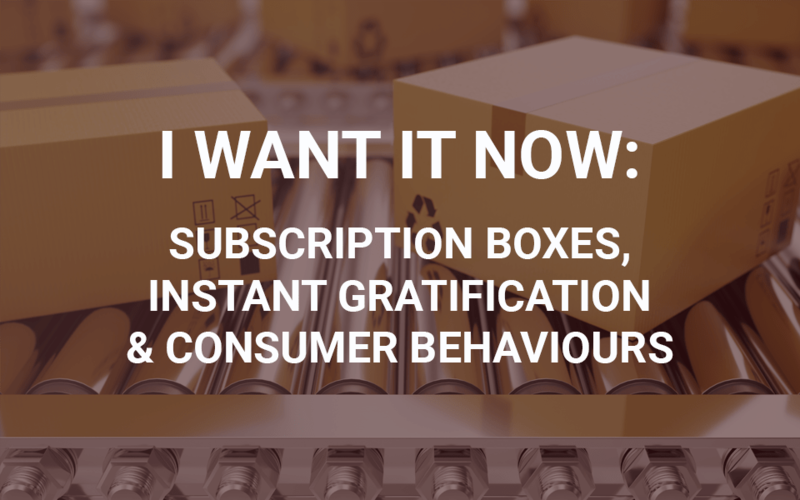 After this, the subscription box trends grew slowly, then between 2005 and 2011 we slowly saw the introductions of some of the boxes we know and love today. Graze came to life in 2007, and brought interesting and varied snacks to the masses. It satisfied both the need for ‘newness’ and the growth of the health food trends we’re immersed in today. In 2010, another household favourite came into being — Birchbox. Here, the service hit a brilliant balance of cheaper and more expensive products. The balance is achieved by offering smaller quantities of high quality makeup/hair care/skin care/etc. It satisfies the desire to have the very best of products with our desire to find a bargain. This is further enhanced by Birchbox offering the ability to highly personalise what products you receive. The personal touch provides the illusion that each and every box is tailor made to the individual, and retains interest month after month. Recommendations of similar products connect new offers, without the consumer ever thinking about leaving their service provider. Subscription boxes are tapping into our need for new, and our need for convenience. There are now brands offering new sports leggings each month, pairs of tights, tasters of gins and beers from around the world… The list goes on. After tackling our need for ‘new’, the subscription services have moved onto our latest perceived need — convenience. Convenience is the hook that now keeps us on the proverbial line. Consumers are busy. Busy consuming information, it’s not just their work — it’s their social life too. In the UK, we spend around 2 hours each day on social media. So, if you’re not working in front of a screen (which more and more of us are) then you’re probably on a social network looking at what your friends and favourite celebs have been up to. If you’re not doing either of those things and have some free time, you’re likely to either be watching a different screen which is filled with films, games, books or shopping options. To adapt to this, the subscriptions now remove the need to ever really leave the house. You can have all the ingredients for all your meals sent to your door each day. The joy of healthy, home-cooked meals overrides a part of many busy consumers brains. They’ll pay £15 for a meal that really, only costs £9 (or so) to source the ingredients for. Convenience wins over cost. It’s not enough to offer the best product anymore, you have to offer and deliver it quickly. After you’ve delivered the first product you need to be offering a second one almost immediately — and it has to be better than the first. More personalised, more accurate, more effective. If you can tap into the consumer’s emotions, you don’t need to be providing essential services. One of the latest boxes blowing up on Instagram is the ‘Singles Swag’ box. It hooks you in with empowering messaging and the promise of ‘fun, stylish full-sized products to amazing single women’. With 20% off your first box, it’s a tempting offer. Your initial offering is the bait, the second is the hook, and whether you want to, or can, sell a third service is up to you. The incentive to buy comes from either a discounted, or free first product. Offer a discounted first delivery, or a free first step (for services). So long as you keep them hooked, and keep your offering seemingly ‘new’ and you’re onto a winner.